Chart No. 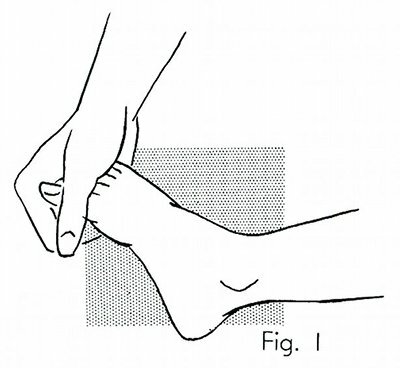 37 - Adjustment of Toes in One Move - Big Toe Adjustment and Its Reflexes. The firm grip of the right hand over the toes, ready for the adjustment. The movement is a quick motion of the entire hand, bending the toes down and pushing the arch up from underneath by the finger contact. This releases tension all over, especially across the shoulder girdle where it reflexes to. The finger contact clearly under the transverse arch. 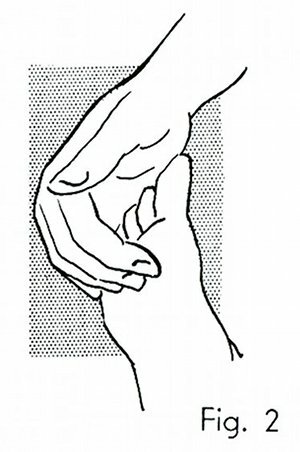 One finger tip [fingertip] under each joint is the preparatory point. It is a release for nervous tension and emotional locks thru [through] the brachial plexus. It is the negative pole to the shoulder girdle as a respiratory release. 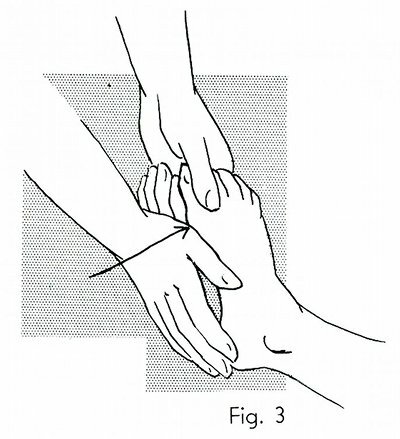 Do not use this adjustment on an arthritic joint. The big toe adjustment given here is a valuable move for the release of tight shoulder blades which the doctor cannot get under to lift; also for sciatica and prostate trouble and enlargement. The womb, too, has a reflex here, and lastly, it is the bunion adjustment. The correction is made by a sharp smack against the big toe joint with the soft part of the palm near the third thumb joint. It will give a click most of the time. The object is to break the lock and fixation here of the energy currents that affect many parts of the body. Secondly, the physical objective of the bunion adjustment is to replace the cartilage of the toe joint by a sharp blow. This joint when locked is stiff and sore. If the doctor succeeds in breaking that lock, even with a very light slap of the hand, the toe may be very sore and turn blue where the venous stasis is released. Be sure to tell the patient, first. When there is no fixation and stasis, this correction does not hurt. Where there is soreness a mere pull of the big toe will be sufficient for a powerful reaction. All other toes can be treated likewise when the patient permits. It releases shoulder and neck reflex tensions. It is most helpful in sciatica. The big toe joint has a powerful reflex action near the center line and could be compared to an atlas adjustment at its most negative pole. Of the special senses it has a reflex action to the nose, the tongue, speech and hearing center above.